As part of my wife’s sandwich catering I handle all the meat production: curing, cooking, slicing. I had read in a few places about cooking whole cuts of meat at a very low temperature for extended periods but wasn’t able to put it into practice until this past week. I had prepared four whole pork legs for a lunch event on the weekend and was just able to fit them into my oven: they cooked for twelve hours at 200 degrees and came out beautifully cooked. A nice crust on the outside and very juicy on the inside. 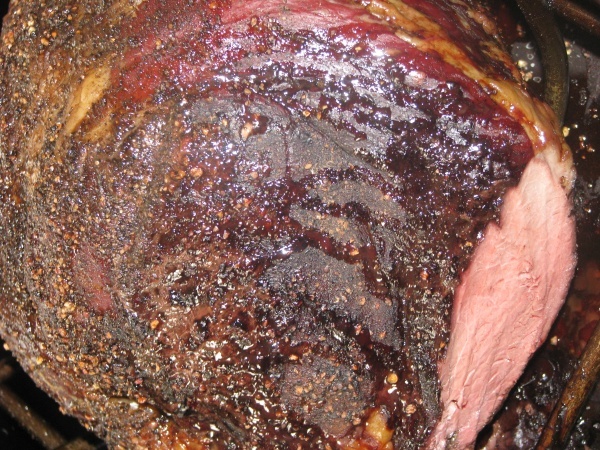 The image above is a sirloin tip: it was cooked for nine hours at 200 degrees and was removed at an internal temperature of 145 degrees. I like medium rare but for sandwiches most people want it at medium. Two drawbacks of cooking this long: the outside gets kind of hard and the meat needs to be flipped. For the pork legs I split the skin, rubbed a marinade of garlic, thyme, rosemary and olive oil and then tied the skin back on. For the beef I coated it with salt and pepper as it was for sandwiches and being sliced thin it would provide a slight texture contrast.